We custom-design each website to meet the client's unique needs and requests. Custom Website Development: With handwritten code validated to W3 standards, our responsive framework ensures your site is readable on both mobile and desktop screens. 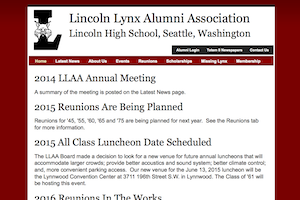 Mobile-Friendly: The website will meet Google’s Mobile-Friendly Standards. We test on mobile devices such as the iPhone, and a variety of browsers including Chrome, Safari, and Firefox. Search Engine Optimization: We implement search engine-friendly links for your webpages, title tags, meta description, and image alt tags. We also submit your domain to Google. Social Media Integration: To improve SEO and user engagement, we establish Facebook and Twitter business accounts integrated with your new website. Professional Content Editing: We edit and proofread your text content, and carefully crop and edit your images, to ensure a strong professional image for your business. Icons: A complete set of custom "favicon" icons that appear in the visitor's browser URL bar and their bookmarks. Printing: For a clean and professional printed page, we provide a custom print stylesheet that formats the page when a user prints from the website. "Coming Soon" Page: To expedite search engine placement, we install a free "Coming Soon" page while we develop your new site. Hosting & Domain: A full year of website hosting and domain name registration are included with all websites we create. Why choose us for your database project? Our custom MySQL5/php5 databases include a secure user-friendly admin system so you can edit and maintain information yourself. Our database systems are rigorously tested for security, including measures to prevent form spam and SQL injection attacks. What can a database system accomplish? Provide your customers a secure online store. Let visitors search your products or directory. Provide a secure login to members and employees. Easily update your own data. Streamline your workflow with custom reports. This phone and internet provider can quickly post notices, job openings, and accept customer applications. 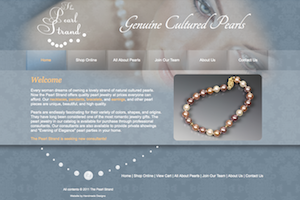 View jewelry by category and purchase online. 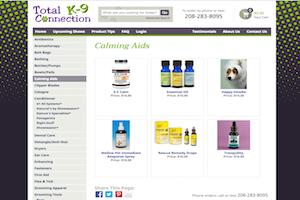 The website owner can easily update the store at any time. Organize products by category and subcategory. Manage photos and options for each product, and offer product search to buyers. 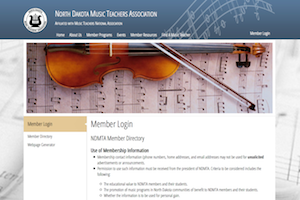 North Dakota music students can search for music teachers by zip code and instrument. Articles, subscriptions, and latest news are conveniently managed through the backend admin system. A comprehensive admin system to manage memberships, send mass emails, record payments, and download custom-formatted reports. Expand your services with a custom database! Contact us for a free written proposal. Looks great on all browsers and computers. Loads faster, free of "junk code" clutter. 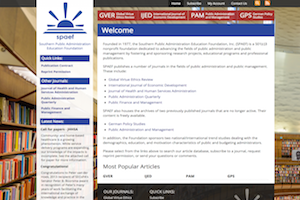 Is accessible on iPhones, tablets, and talking browsers. Is faster and easier to update. Appears higher in search results. With our handwritten standards-compliant code, your website will function properly in new browsers and remain compatible with older browsers too. 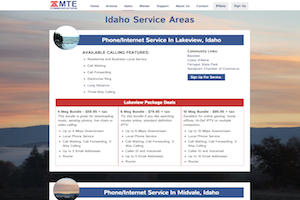 It will look great on mobile devices and on the printed page—no separate "mobile site" necessary. What if my friend/nephew/coworker says they'll make my website for free? Why not use a free template and make my own site? have professional experience with writing and proofreading? test the website on multiple browsers, computers, and mobile devices? optimize your website to improve search rankings and download speeds? provide reliable web hosting and server management? understand email setup, encryption, and database security? offer prompt, friendly tech support? Why should I choose Handmade Designs LLC? 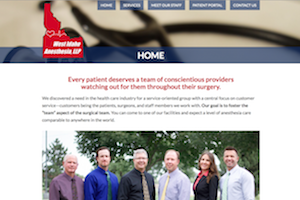 In business for 18 years, we have created over 300 websites for clients in 30 states and Canada. We love our clients! An established company: You can depend on us to be here as your business grows. Clean, streamlined code: Our HTML is validated to W3 standards. We write our own code, so we can guarantee it works. Friendly, personal service: No call centers or ticket systems--we communicate with you directly! Upfront pricing: Avoid surprises. We provide a free detailed proposal for your project. We take care of everything. Domain registration, hosting, email, SSL, social media, and ongoing updates. We are happy to answer any questions you have. Just send us a message!